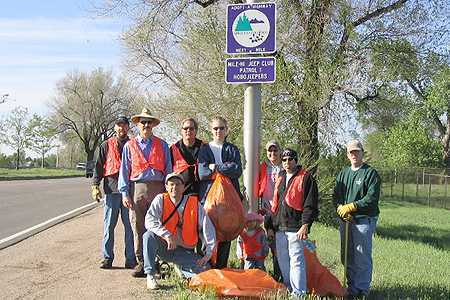 On an early cool late Spring morning, the HoboJeepers met for our 5th cleanup of our adopted highway 391 section. 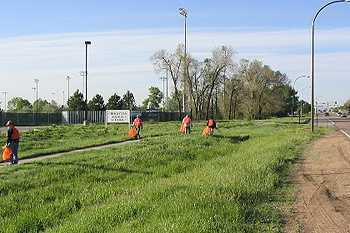 Some of the area had been mowed, but most seemed harder to see any trash in the unmowed sections. 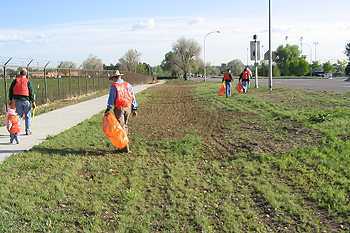 6 of 9 Hobos (and 1 prospective) helped with the cleanup this time around, a great turnout! 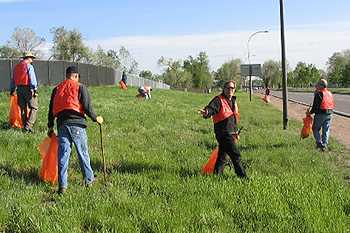 Many thanks to all for taking time out early on a Saturday, to accomplish our responsibilities to our Adopt-A-Highway obligation. Katlyn Fisher with pick in hand was ready for for fun!! 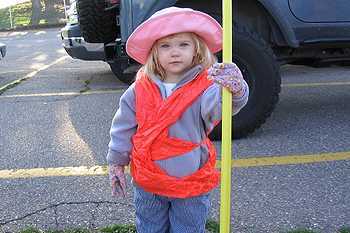 We all met at the Jefferson County Stadium at 7am, then we set out with handmade pick-up sticks and bags in hand. SixThree Hobos were in attendance, and included: myself Bill 'Hobo Willy' Hallinan, Marc 'Nugget' Gilbertson, Scott 'Mad Max' Maxwell, Patrol Leader Paul 'WeiszGuy' Weisz, Brett 'BWieszGuy' Weisz, Katlyn 'Little Fife' Fisher, Prospective Hobo Jeff Simmons, Pete 'JeepDog' Rameriz, and Mark 'Fife' Fisher. (here is east side of Kipling Street near Alameda). The section was a bit trashed since October, but even with 4 people we managed to get it all, and it looked much better. We picked up the usual visual trash. 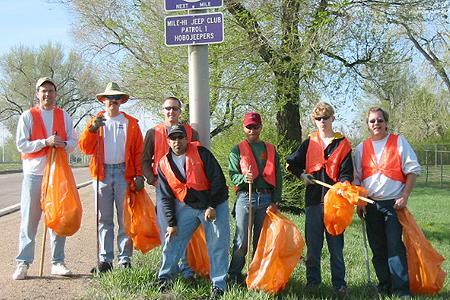 Everyone was in tune with everything picked up except the small cigarette butts. 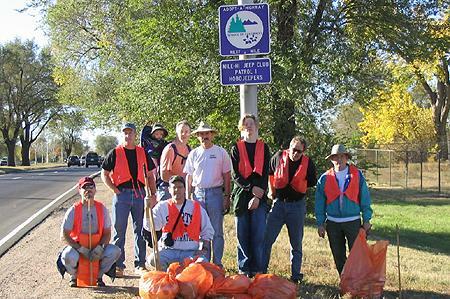 Seems no big finds this time, as most of the trash was common car trash. 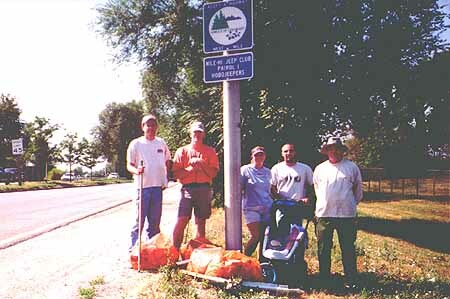 I amazed how people have no guilt throwing trash from their cars. 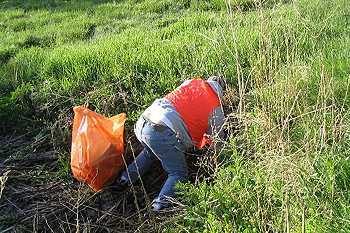 Jeff even dug out trash from a culvert! 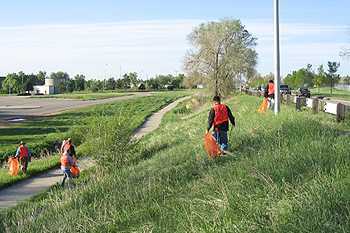 ...as no trash was left, all pitched in with a 'team' effort! 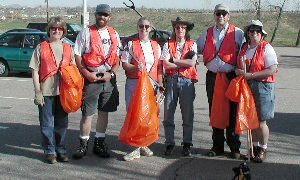 We were finished in about an hour, with trash bags piled up along Kipling for CDOT to pick up. The trash seems to less and less every time we clean. 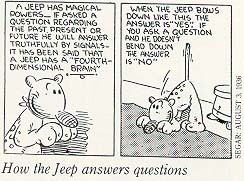 Maybe it's because we keep it clean every 3-4 months. After a job well done, all of us (except Scott) headed over to our Hobo Run IHOP on 6th and Simms for some good grub. 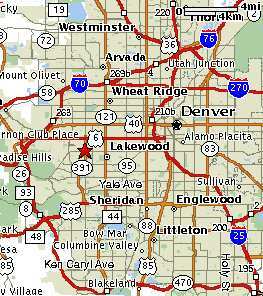 We once again encourage other 4x4 groups/patrols to adopt a CDOT highway somewhere. 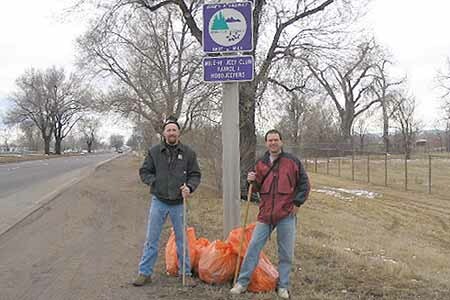 It's a great way to contribute to the community as 4Wheelers, while showing the general public we don't just go up in the mountains and tear them up. 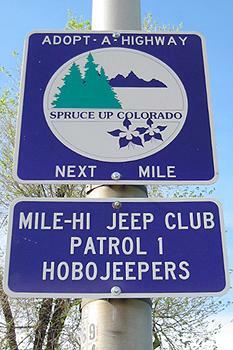 Our next cleanup is planned for a Sunday July 18, 2004, until then---"Jeep, Jeep"! !